It is still really hot here, but I still try to brave the back porch whenever possible. Today, while I was out, a small rain shower moved in and cooled things just a tad. The sun was still out while the rain fell. Norvelle Turner, who helped raise my husband used to say, “the devil is beating his wife” when it rained while the sun was shining. Saute squash and tomato in 2 tablespoons basil butter in a large skillet over medium-high heat 10 minutes or until squash is tender. Serve with remaining basil butter. Process all ingredients in a food processor until smooth, stopping once to scrape down sides. Cover and chill until ready to use. Save any leftover basil butter to slather on hot corn on the cob. Yum-can’t wait to make this one! The Junior League cookbooks always have the best southern recipes 🙂 Thanks for sharing. Christi ~ Can’t wait to try your recipe, sounds delish! There is nothing like eating outside in the summer – unfortunately is has been too hot to do that here. Ahhh…so pink and pretty – even if you have to play games with the weather. I host a weekly meme called “Summer Sundays”. It’s all about what summer means to YOU! It’s neat to see everyone’s different take on summer. Hope you’ll come and join the fun! 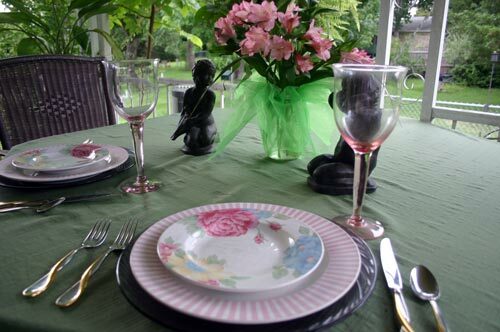 What a luscious garden to enjoy as you dine … your table is beautifully presented … such lovely pink & green. Yummy recipe! Thanks! Happy Pink Saturday! Love the pink stripe plates. Very cute. I have not done a pink tablescape yet but you have inspired me to do so. Maybe next week. Mmmm, that basil butter sounds wonderful! 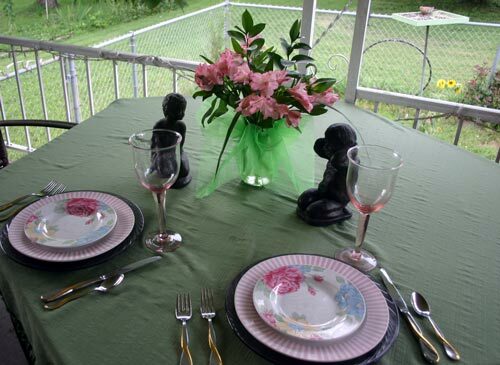 Such a beautiful pink table setting and it looks cool and refreshing for the hot weather. Basil butter….good idea for dressing up veggies. I’m going to try it on others as well. Your recipe sounds delicious! I could really sink my teeth into something like that right now. I invite you to link up to my Vegetarian Foodie Fridays carnival. Hope to see you there! I am imagining all kinds of vegetables that would be good with that basil butter. Thanks for sharing! I’m a big fan of the pink stripes! Adorable pink plates and stemware. I love pink. 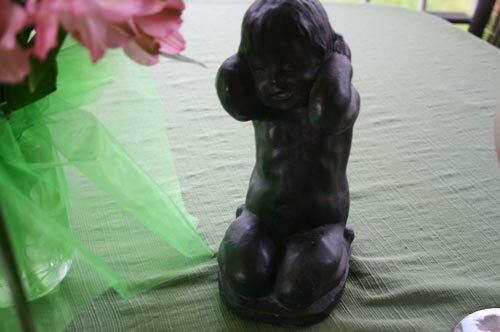 It goes so well with the green tablecloth. Those figurines are darling. I heard that same saying about the sun shining and rain, LOL. How lovely! I really like how you put the touch of green netting in with the flowers. Everything looks so fresh and summery. I also think that anything with something called basil butter would have to be delicious! Love all the pink! Those flowers look great with your pretty plates and pink glasses! Oh, your tablescape looks like it’s waiting for a summer breeze to pass by! I was lucky enough to find two striped plates like yours at GW a few years back for a dollar each and have been able to do a lot with them. Still looking for at least two more Mine are TIENSHAN Stoneware, Prima Rosa. 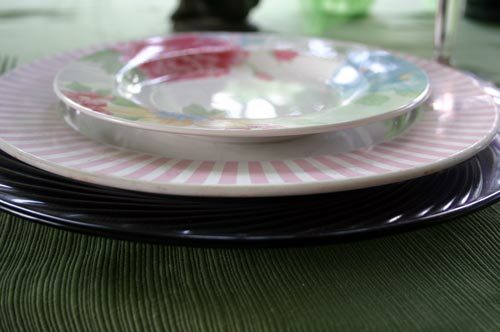 Even bought a pink and green tablecloth bordered with identical stripes from Williams Sonoma just to go with my two plates!!! Thanks again for such a cool tablescape. 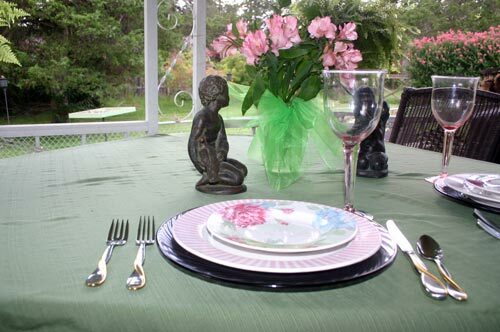 Love your pink patio tablesetting! The dishes are gorgeous and the inspiration is too! Flowers are just the right inspiration. That is pretty clever to put all those link parties into one post. I guess that means I’ll see your link a few more times. Thanks for sharing. 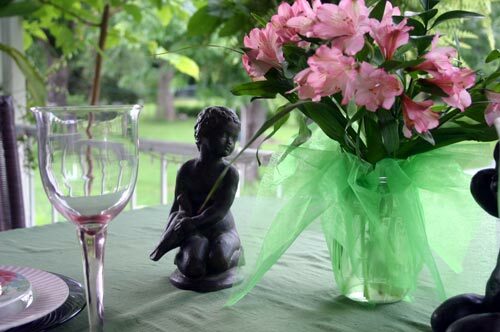 What a pretty table – pink and green is a favorite color combo! 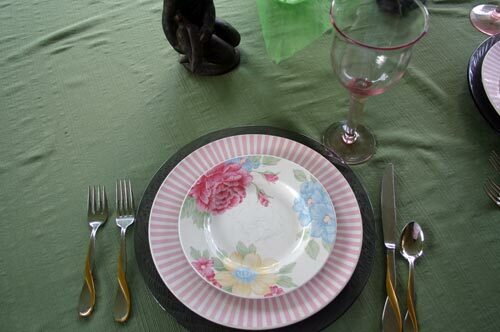 And I especially liked the pink striped plates. yes, I agree, this plates together look so charming. And the flowers are beautifull. Squash is something what grows here very nice. I will save your yummy recipe, too. 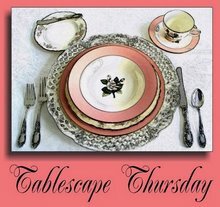 Your pink table is really very pretty…the salad plate looks great against the pink/white stripes. Your flowers are beautiful. What a lovely inspiration! I love the stripes with the florals. It is just a wonderful combination. What a pretty pink table. Beautiful dishes, I love your combination. 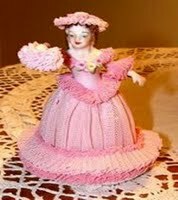 The combination of your plates are pink confection! They are so pretty together. 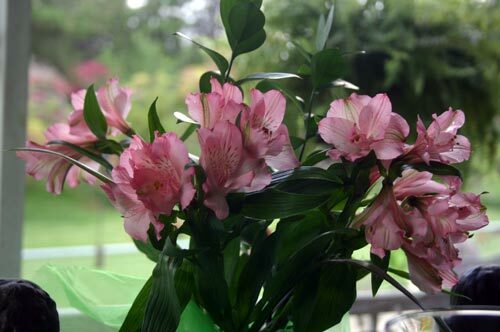 And I can see why you were inspired by the sweet pink bouquet of flowers. The squash in my garden is almost ready. I’m saving this recipe! Lovely tablescape. I am in love with your pink stripe plates. Oh, those are SO cute! Love your recipe, too. Jr. League cookbooks are always the best, and that basil butter sounds delicious! Thanks for sharing that lagniappe with us. thanks for the recipe I will be trying this weekend! the table looks delightful with the stripe and flowers..